in gas form and fine particulates which are easily respirable. In addition to analyzing comfort parameters (temperature and humidity), our analysis tool controls the air concentration of indoor pollutants and informs you in real time. Carbon dioxide (CO2) is a molecule produced by the human body during respiration. It is a comfort parameter in the same way as temperature and humidity. Its concentration in indoor air is related to human occupation and air renewal. Its measurement is an indicator of air containment level. Volatile Organic Compounds (VOC) account for a large proportion of indoor air pollutants; there are hundreds of them in gaseous form, some of which are carcinogenic. The best known are Formaldehyde and Benzene. Adhesives, paints, cleaning products, perfumes, pens… are traditional sources of VOCs. 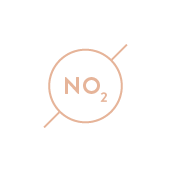 Nitrogen Dioxide (NO2) is part of the nitrogen oxides family (NOx), they are yellowish gases with a pungent odor. Carbon monoxide (CO) is a colorless, odorless and mortal in high concentrations. It is released in large quantities when combustion heaters or hot water production are poorly maintained and / or operate in a confined atmosphere. Particulate Matter (PM) are found in dust, which itself is composed of a wide variety of contaminants : smoke, soot, pollen, spores, allergens. Some activities produce significant amounts or cause resuspension of particles in the air. These small particles can be inhaled and be responsible for worsening the health of people with heart and lung disease.